Your teeth should be a source of pride, not stress nor embarrassment. There are many reasons teeth do become this negative thing: neglection, freak accident, and even stress, to name a few. When neglection is the cause, you only have yourself to blame. But when the cause is a freak accident and stress, you have our entire sympathy. It’s devastating for your teeth to be impacted so severely by external causes. One of the worst things to derive from stress when talking about teeth issues is Bruxism. 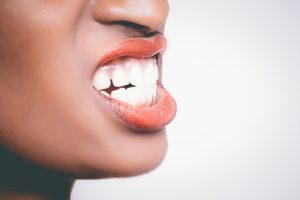 Bruxism is perhaps (ok, definitely) a term you’ve never heard before, but the behaviour is something you will know and perhaps even suffer from. So what is it? Bruxism is the gnashing, clenching, and grinding of your teeth. Whether it’s throughout the night, when you’re stressed at your job, or even when you’re resting, most people do suffer from Bruxism. Today, as the behaviour is something nobody wants, we’re going to let you know how it can be avoided. A statement which every single dentist in the world wish their patients would treat as a mantra. Avoid caffeine. Avoid caffeine. A can of coke? No. Never. Avoid caffeine. Unfortunately, however, many don’t and they suffer because of it. Caffeine is one of the most commonly ingested toxins in the world. Not only is bad for your physical health, it ruins your teeth as well as making you grit them. So, next time you crave a drink riddled with caffeine how about having a peppermint tea instead? It really will benefit you. Sleep More – Like This Banbury Dentist! Funnily, this is also related to your caffeine intake. Consume less caffeine and you’ll sleep more. Sleep more? Well, you more relaxed you are the less likely you are to grind your teeth. A better-slept person is a more relaxed person. This is within reason, of course; if you sleep 12 hours before work you will probably be overslept. Aim for 8 hours. After tending to the great people of Banbury, this Banbury dentist always gets eight hours. Learning to acknowledge what your cause of stress is and acting to reduce that cause is an incredibly emotionally mature thing to do. So, it’s totally natural if you struggle to do this. Learn, however, and your teeth will only benefit. Live a peaceful life and you’re going to be much less likely to grind your teeth. In yoga one of the first things they will tell you to do is to relax your entire body. Make sure your shoulders are dropped. Forgot all your stresses. And finally, unclench your jaw. If you can teach yourself to do this throughout the day it will greatly help your fight against Bruxism.